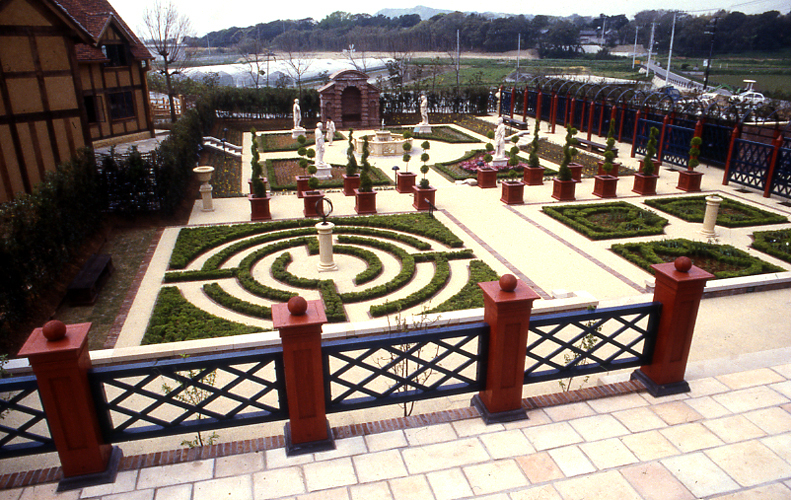 The Shakespeare Country Park and Rosemary Garden have been developed by the Township of Maruyama with the help of grants from the Prefectural Government, as a tourist attraction along the Flower Line Road - a route along the sea shore popular with day trippers from Tokyo. 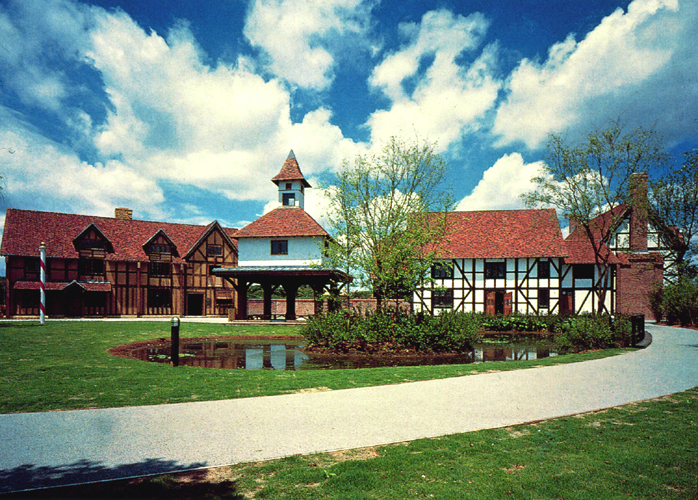 Completed in 1997, the Park displays a range of buildings and landscapes characteristic of Elizabethan England. 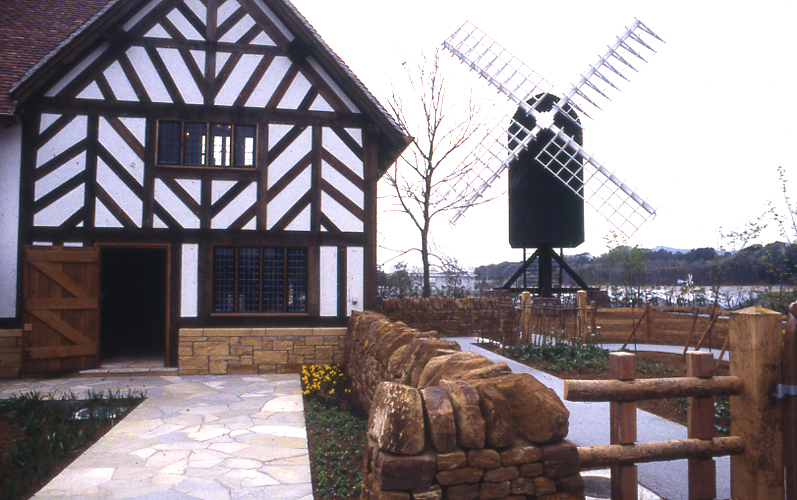 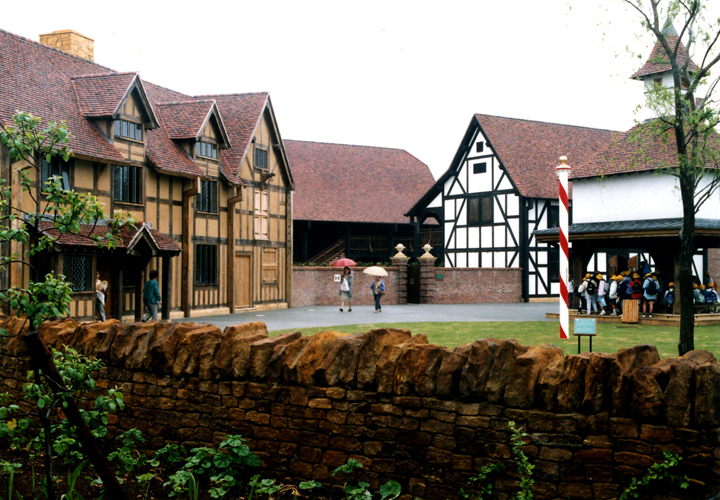 Among them are replicas of the original Mary Arden’s House and Shakespeare's Birthplace in Stratford-upon-Avon; conjectural recreations of the original Stratford Market Cross and of 'New Place', the house in Stratford to which Shakespeare retired at the end of his working life; and a full size wind-mill. 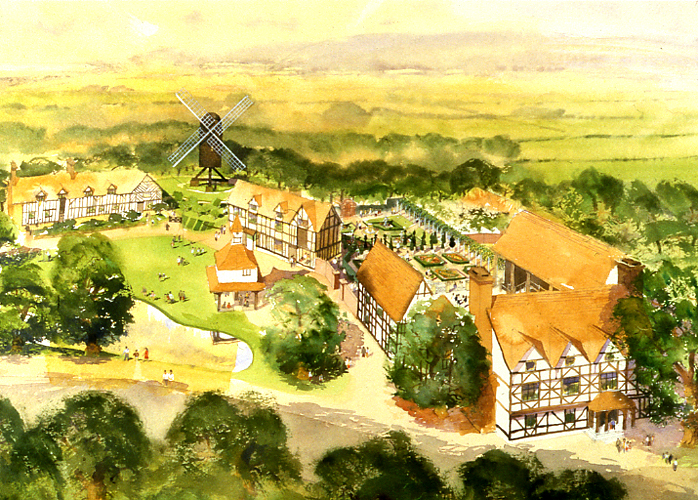 The buildings are grouped round a village green with duck pond, stocks and maypole. 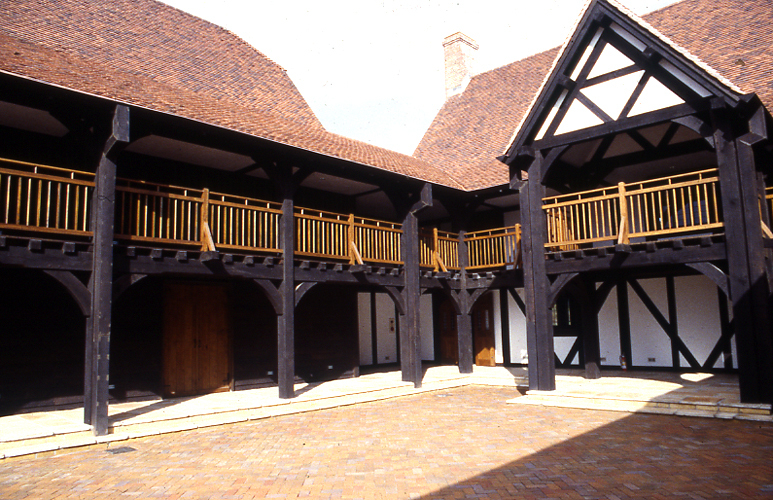 The buildings are constructed in the authentic half-timbered system using peg-jointed frames of 'green' (unseasoned) English Oak with plastered infill panels. 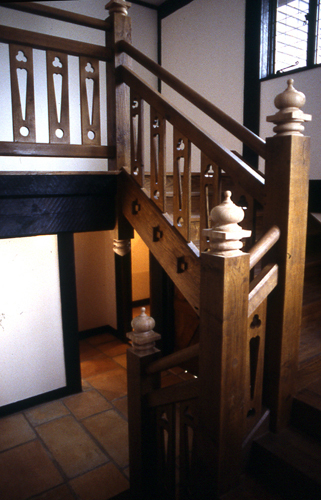 The timberwork was prepared by Border Oak in the UK and then shipped, with the other building materials and fittings, and assembled in Japan. 'New Place' provides the entrance to the complex. 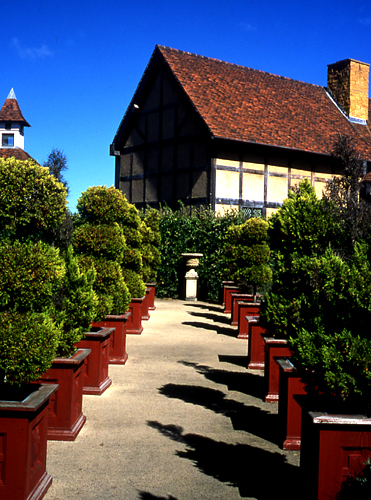 It and other buildings frame a galleried courtyard that overlooks a typical Elizabethan formal garden, planted with flowers shrubs and herbs of the period. 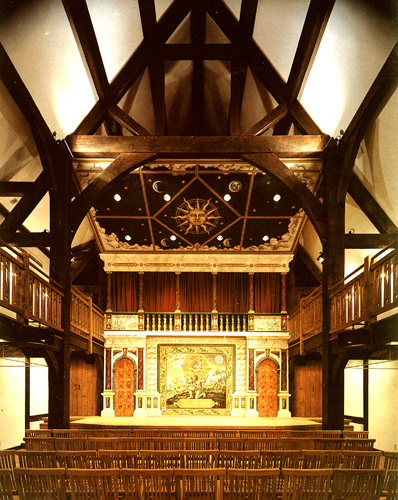 Above the entrance is an Great Hall modelled on the beamed dining halls of the aristocracy, which houses a display illustrating Shakespeare's life and work. 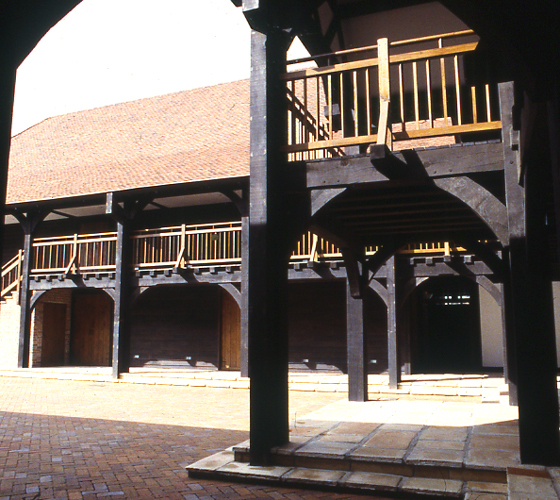 Next around the courtyard is a barn-like building fitted out as a typical Shakespearean theatre complete with its overhead soundboard and permanent painted scenery with entrance doors, balcony and curtained recess. 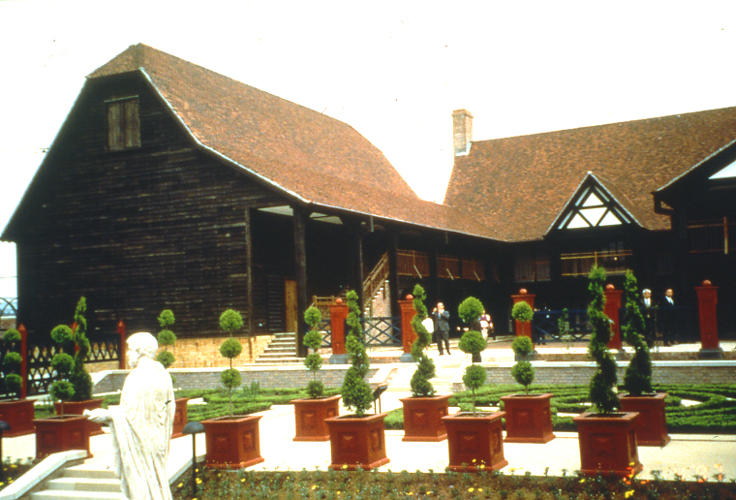 Facing it across the courtyard is a souvenir shop with administrative offices above. 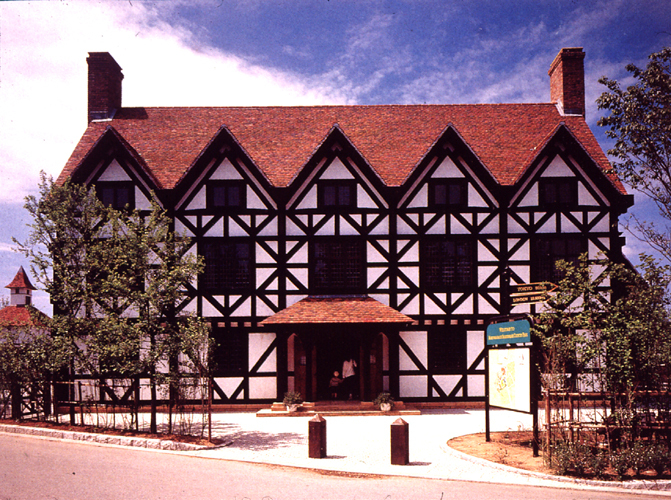 The interior of 'Shakespeare's Birthplace' is completely furnished with authentic replicas of 16th Cent furniture, table-ware and hangings. 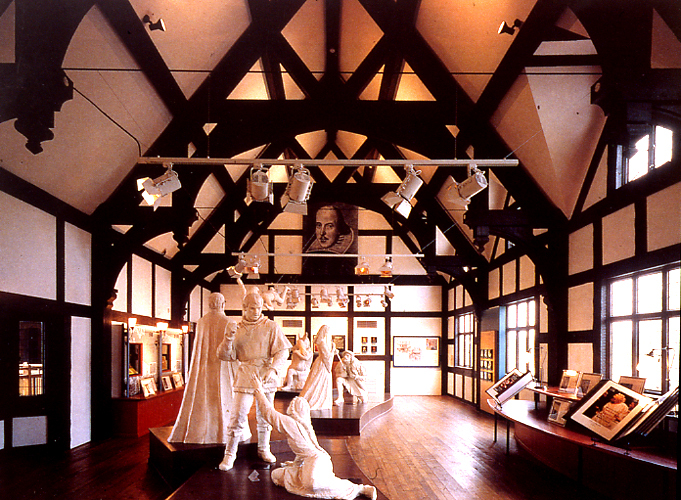 Fully clothed figures demonstrate how Shakespeare's family used the living rooms and workshop.